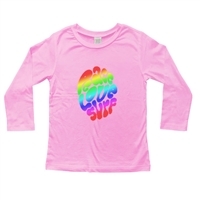 Surfer Baby Long Sleeve Layered Double Sleeve Toddle T-Shirts - Fun Surf Designs for Surfer Kids: Surfboards, Hibiscus, Surf Toddler, Hippie Peace Love Surf. Outfit Your Child in Cool Surf Style. "You're Never Too Young To Be Cool!" Cool looking double sleeve long sleeve toddler shirts with fun surf graphics. Outfit your little Surfer in some cool surf style with these unique layered-look kids tees. 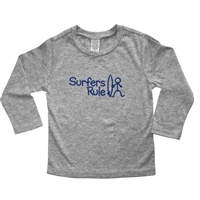 From the Surfer Dude to Surfers Rule and Surfer Girl designs, these warm surf-inspired tshirts are fun to wear for your little Surfer Baby toddler as well as make a cool gift. We believe "You're Never Too Young to Be Cool!"